“The Awakened Company recognizes the integral power of humane practices within business. Companies driven by noble service to all stakeholders are in the position to elevate our whole world.” - TONY HSIEH, CEO of Zappos.com. “This is a must-read for those of us in the organization world. - DAVID DANIELS, M.D., Professor Emeritus, Stanford University, and Enneagram pioneer. 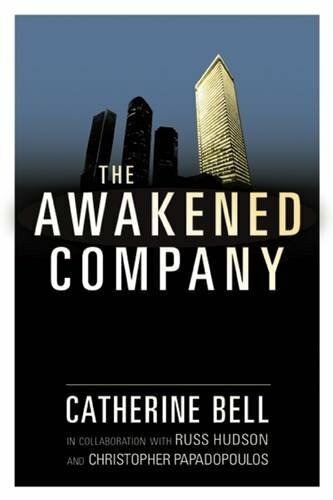 The Awakened Company represents an evolutionary leap from the “business is business” mantra that stifles creativity, neglects human wellbeing, and treats work as separate from the rest of life. Entrepreneur Catherine Bell reveals how businesses can be prosperous, sustainable, caring, interlocking communities that benefit all their stakeholders—those who work in them, the communities they serve, the international community, and the planet. The book’s premise is that work isn’t separate from life, and the metrics for success in business need to change at a fundamental level if the world is to transcend its present crises, which increasingly threaten us all. There’s another way of doing business, and a shift in our behaviour could in very short order fuel innovation, open up undreamed of markets, and by so doing bring prosperity to the entire planet. As cofounder of BluEra, Catherine Bell has over ten years of international executive search experience in industries including renewables, oil and gas, power, infrastructure, high technology, and private equity, through which she has helped build many great companies in North America, Europe, and elsewhere around the globe. She holds a degree from Western University and an MBA from Queen’s University, is certified in the Riso-Hudson Enneagram and the Nine Domains, and has taken the ICD not-for-profit course. Renowned for her ability to build high performance teams, Catherine speaks frequently on leadership to business schools and companies. She is currently on the Board of the Distress Centre, Calgary, Alberta.